A man with over five decades invested in radio is calling it quits. Fabmar Communications Vice-President of Broadcast Operations Ken Singer is retiring, and his final day at work is Friday, Nov. 30. Singer’s lengthy career includes experience on-air, in sales, and upper management. “I think one of the greatest things about my career is the tremendous people that I’ve met along the way, and made some really good long-term friendships,” Singer, who remarkably has only worked for three different companies in his career, said. A lot has changed in broadcasting since Singer started in 1967. Singer believes change is a good thing for the industry. 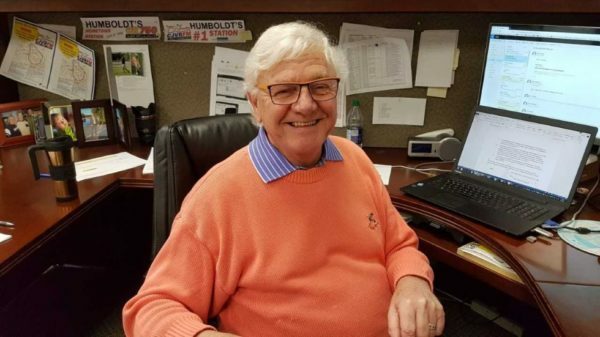 Singer most recently oversaw the transition of Fabmar Communications’ four radio stations to the Jim Pattison Broadcast Group, and he said it’s a great fit. Singer said he is still a big believer in the power of radio. Singer said it’s his first love. Praise for Singer was quick to come in. “I feel very privileged to have had the chance to work with Ken at CJVR since 1996,” Gemmell said. “Ken Singer is one of a kind. A true leader of this organization and will be missed,” said CJVR/CK750General Manager Linda Rheaume. “Regardless of the situation, you could always hear ‘Well, let’s ask Ken'”. Rheaume said she could always count on Singer to teach and guide, and she will be forever thankful for the opportunities he gave her. What a great career…I still remember the days of Ken Sebastian Senger and CKCK Regina on air and CKOM Saskatoon as well. I met Ken back in the early 80’s and he was a true gentleman. Hope to see him on the golf course in Palm Springs! Congratulations Ken! I think we hit similar notes over the 51 year period. I started in ’63 so got a head start on the retirement game. Haven’t regretted it yet. Enjoy!